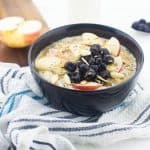 Blueberry apple oatmeal recipe – Start your mornings on a healthy note with this simple yet tasty blueberry and apple oatmeal. If you have been following my blog from the start then you will already know that I’m a huge fan of a good variety of breakfast dishes. I’m talking about anything from my blueberry and banana overnight chia seed oats right down to some Caribbean green banana porridge . I am definitely not partial when it comes to what’s for breakfast at all, and probably never will be. I will quite happily mix British traditions with my Caribbean culture. To me what’s more important is sustaining my body with something nutritious in the mornings. Without breakfast I simply couldn’t function, I would be tired, moody and just overall sluggish in my movement. That’s not the sort of perception I’d feel comfortable with exuding towards others, rather I like to be bright eyed, content and refreshed for the morning ahead. 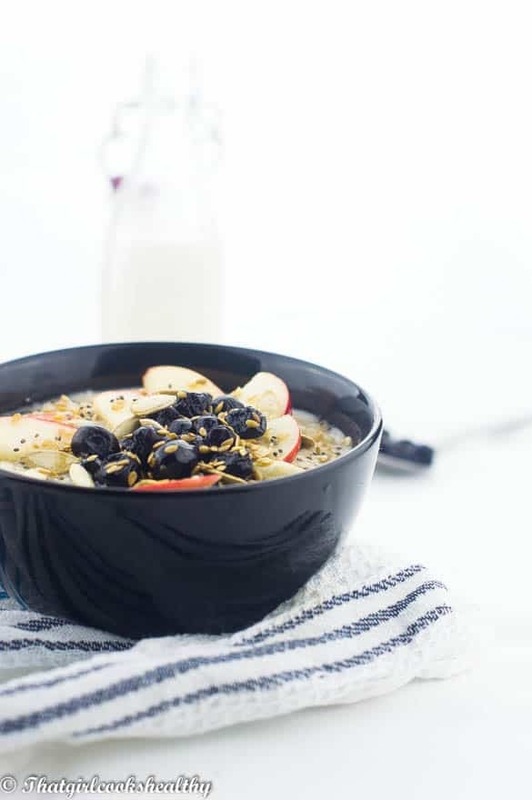 That’s why this blueberry apple oatmeal recipe should become your best friend, forever and ever. 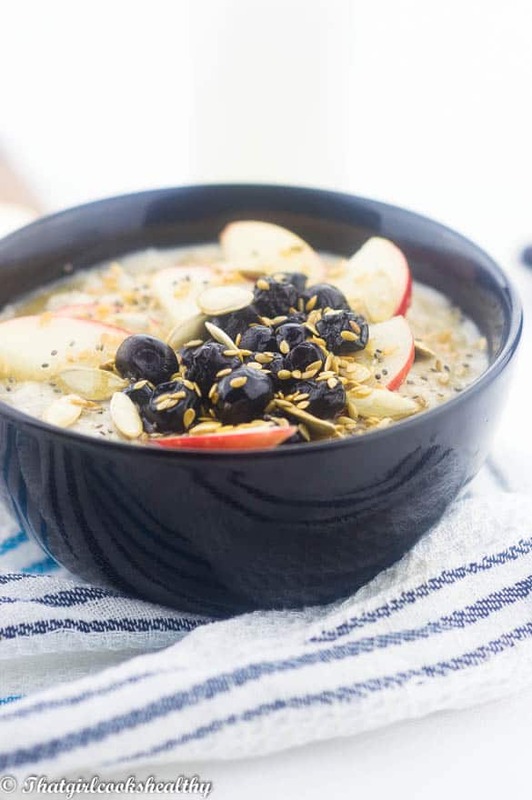 The texture of this oatmeal is extremely smooth and extra creamy which I credit the coconut milk for such amazing results. Although I like to rotate between various plant based milks – think cashew milk , almond milk , my favourite vegan milk for oatmeal that yields creaminess has to be coconut milk . However that doesn’t mean that you need to feel obligated to follow suit, I have a few recipes for alternative plant based milk on the blog so pick your preference. 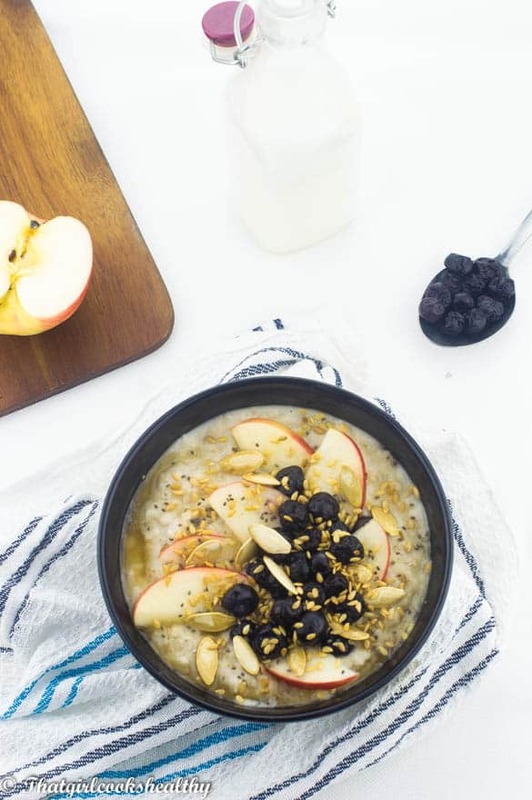 The great thing about my oatmeal recipe is the topping – two words….go mad! Go crazy with the toppings, add whatever you want besides the blueberry and apple. You could add chia seeds, pumpkins seeds, goji berries, raisins, cranberry, nuts, additional fruit and a dollop of syrup. 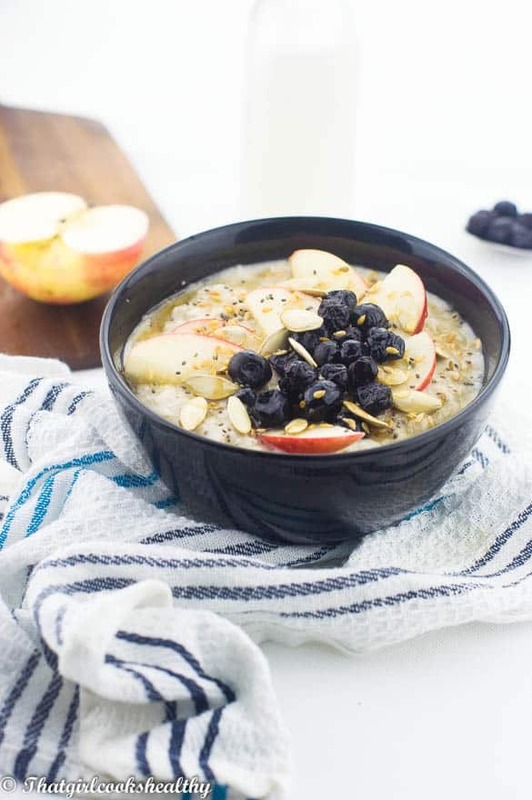 The list is endless for such a rich and creamy vegan style blueberry apple oatmeal breakfast. Heat the milk and the cups of water in a medium saucepan until it begins to simmer. Reduce the heat to low and allow to simmer (stirring occasionally) for an additional 3-4 minutes. 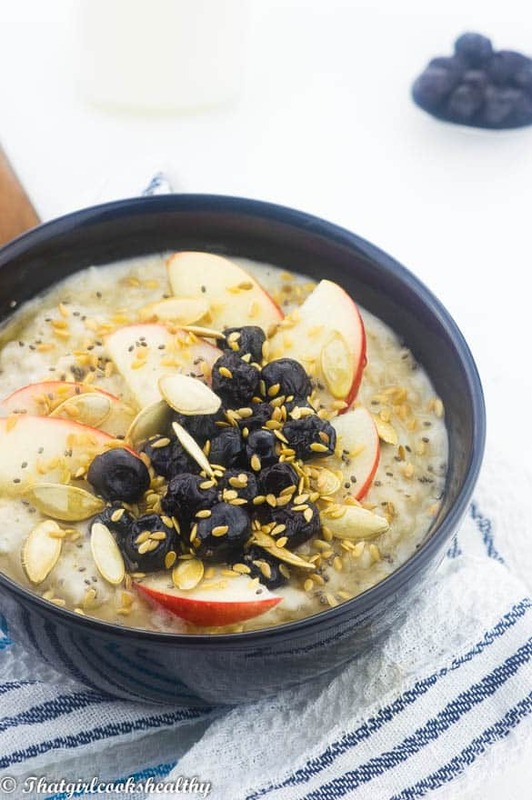 Divide the oatmeal into 2 bowls then add some of the blueberries and apple to the oatmeal. Oatmeals are always great. I’m not actually vegan but this one looks really good anyway! Thanks Sean. You definitely don’t need to be vegan to enjoy this recipe though!